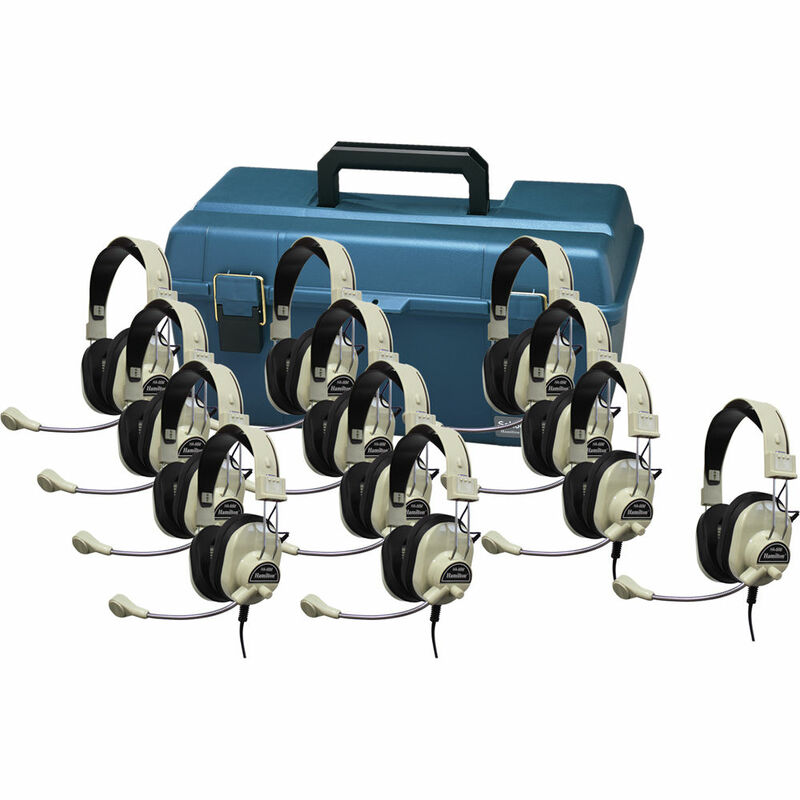 The LCP/12/HA66M 12-User Lab Pack with HA-66M Headsets from Hamilton is an affordable solution that allows 12 users to listen to audio and make recordings. The system includes 12 HA-66M deluxe headsets and a lockable plastic storage case. Each headset features 40mm mylar drivers with ferrite cobalt magnets to deliver high-quality audio with a wide frequency response. The closed-back earcups and thick around-ear vinyl cushions provide lasting comfort and noise isolation, while the adjustable headband provides a snug fit for virtually any head size. Each headset also has an integrated volume control in one of the earcups for making quick and easy adjustments. The omnidirectional electret condenser microphone provides clear vocal pickup. The mic is on a 4.7" flexible gooseneck boom for precise positioning. The 7' single-sided cable provides plenty of slack and has a pair of 3.5mm connectors. One connector connects to a headphone jack, while the other connects to the mic input of a recording device. These standard connectors provide wide compatibility with a variety of devices, such as computers and tape recorders. The durable plastic storage case has enough room to safely store all of the headsets. It has a toolbox-style design with secure clasps to prevent accidental opening. There is also a padlock hole so you can add a lock to prevent unauthorized access. A folding handle on the top of the box provides convenient portability. Note: Lock for storage case not included. Box Dimensions (LxWxH) 22.2 x 15.5 x 12.8"